For some reason the media zeitgeist is making a big to-do about this being the 30th anniversary of THE PRINCESS BRIDE. But another medieval comedy has Cleveland Movie Bloggers of a Certain Age feeling ready for the old-age home (or, around here, just another crummy minimum-wage job I’ll hold until dropping dead in my late 90s). It’s been 42 years, believe it or not, since MONTY PYTHON AND THE HOLY GRAIL. Now comedy legend and Python troupe alumnus John Cleese is touring live with a revival of the picture. “John Cleese and the Holy Grail” is the name of the program. In it a screening accompanies raconteur Cleese on stage, summarizing his own wide-ranging career, genesis of the Pythons, and the making of the best-known movie spinoff from the groundbreaking BBC-TV comedy team. MONTY PYTHON AND THE HOLY GRAIL was shot on a relative shoestring in Scotland. 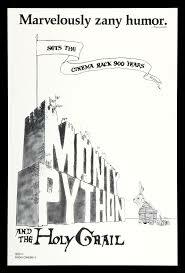 It not only became an absurdist classic, it also was the springboard for Python animator Terry Gilliam becoming a director with a unique mad-surrealism brand, and the direct inspiration for the musical Spamalot. Curtain time is 7:30 p.m. in the State Theatre, 1501 Euclid Ave. in downtown Cleveland. Admission ranges from $59 to $254 (for ticket prices like that you should get a complimentary Holy Hand Grenade of Antioch). Call 886-546-1353.